Eco-friendly landscaping, which is also known as sustainable landscaping is becoming more popular and plays a large role in hardscape design in Roswell. If you're changing up your landscape and are looking for unique design options, including hardscape ideas in Roswell, here are some things to think about to improve both the aesthetics and sustainability of your landscape design. An important component of sustainable landscaping is what plants are used in the landscape as well as how the plants are used. Plant choice and placement is so important because to be sustainable the plants should be both functional and reach their aesthetic goals. This often means that native plants are used because they'll easily thrive in the conditions they're planted in and adapt to their environment easily. The plants should also be installed in areas where they can follow natural growth so that a lot of pruning and other intervention isn't necessary. Water conservation is another important aspect of eco-friendly landscaping. It includes the use of natural irrigation designed to the smallest detail so that plants are adequately watered, but not overwatered to waste water. The design may include rainwater harvesting to use in irrigation or using plants to mitigate runoff. Hardscape design using permeable paving options or grass pavers is part of water conservation as well. Integrated pest management means that the life cycles of pests like insects and weeds are considered when designing the landscape. 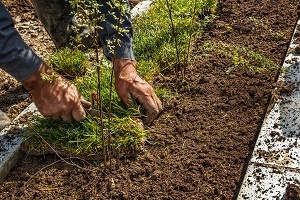 Certain pruning techniques or irrigation patterns can help naturally reduce pest problems so that less intervention is needed. A sustainable landscape will also use natural pest controls as much as possible to reduce the amount of chemicals and harmful substances that are released into the environment. The overall goal of sustainable landscaping is to reduce the impact on the environment; a major way to do this is through significantly reducing costs. This is done by saving money on maintenance like pest control, water, and pruning. The plants used in the landscape are able to grow naturally without the use of harmful chemicals and expensive labor. The long-term costs of the landscape design are significantly reduced when these principles are implemented.